Mystery of the contradicting abilities of the AMPK enzyme in cancer growth finally solved. 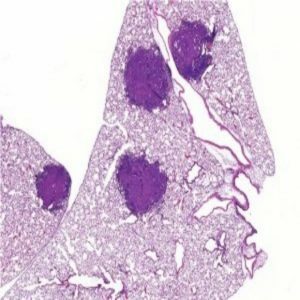 Genetically engineered lung tumors – solid purple. Credit: Salk Institute. Previously thought to suppress tumor growth by slowing cell metabolism, the AMPK enzyme has long confused researchers with its seemingly contradicting ability to help some tumors grow. In a study recently published in Cell Metabolism, researchers from the Salk Institute (CA, USA) have solved the mystery surrounding the protein complex. The results showed that in late-stage lung cancers the enzyme’s cellular recycling signal can be activated, leading to the cannibalization of pieces of the cell. This then provides tumors with nutrients necessary for their growth. The onco-suppressing or promoting activity of AMPK is dependent on the context and size of the tumor in question. In healthy cells or small tumors, the AMPK protein can slow cell growth and modulate cellular metabolism based on availability of nutrients. In previous studies, Reuben Shaw, senior author on the current paper, has demonstrated the onco-suppressing ability of AMPK by halting the faster metabolism that occurs in tumors. Using mice models, the team showed that when tumors are large enough, the cells in the center have limited access to necessary nutrients, which leads to the activation of the enzyme and the triggering of the cellular recycling pathway via the promotion of Tfe3 gene expression. “Our study shows that the same dysfunction in a genetic circuit that causes non-small-cell lung cancer to begin with is necessary for more mature tumor cells to survive when they don’t have enough nutrients,” commented Reuben Shaw, senior author of the paper. “We’re excited because more advanced tumors seem to rely on AMPK to survive, and understanding this mechanism means we may be able to treat them” added Shaw.